The Carlisle Hellcat is a totally surface mixed 4 inlet burner that offers a high level of versatility in the flame. This wide range of flame capabilities makes the Hellcat the perfect bench burner for beginners and experts alike. The Hellcat Bench Burner is suited for use with both hard and soft glass. It has been designed for increased productivity, attainable through higher flame temperatures and increased flow capabilities of gases. The center fire of the Hellcat is exactly the same as the Mini CC, Seven tubes, then using the outer two adjusting knobs you enable 14 more tubes to give you a much broader range of heat to work with. The body of the Hellcat is constructed of brass and has a stainless steel nose cone to help the torch run cooler and prevent heat build-up. The tube matrix, which is constructed of seven tubes in the center and 14 tubes on the outer fire, is made of stainless steel. 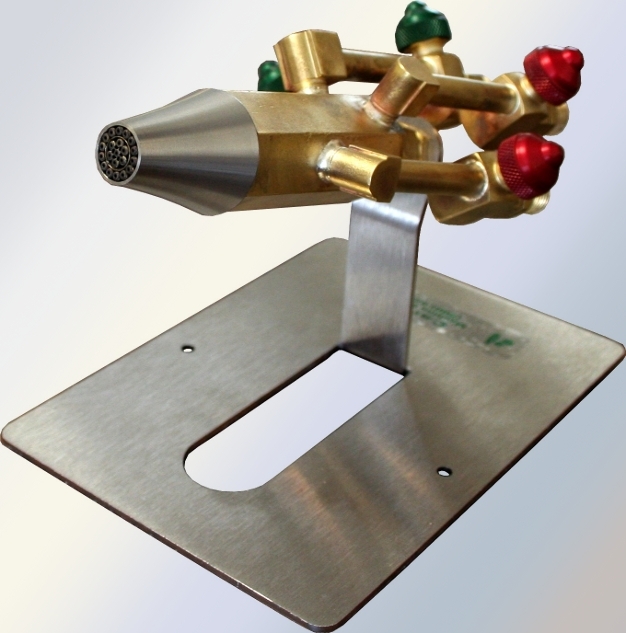 The stand itself is designed for ease of use and places the burner head at a 45° angle. The connection of the body to the stand is made with a ball joint, allowing for an increased or decreased tilt of 15° and articulation. This allows the burner to have excellent positioning capabilities. The base also has four rubber feet to reduce the likelihood of the unit from sliding during use and features two mounting holes for permanent installations, the same as the Mini CC. Consumption based on standard usage is approximately 1.5 LPM (Liters Per Minute) of propane and 7 LPM of oxygen on the center fire only. With both inner and outer fires, 4.5 LPM of propane and 21 LPM of oxygen. This burner may be used with oxygen and either natural gas, propane, or even hydrogen. The recommended operating pressures are 2-3 PSI (Pounds per Square Inch) for fuel gas and 5 PSI for oxygen. A Centerfire Add-On is now available for the Hellcat.